Ms. Kanlaya Muangsan, Program Officer. 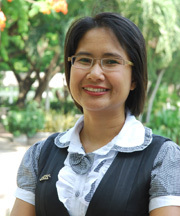 Ms. Kanlaya works as program officer at AIT Extension since year 2001. Her main responsibilities is assisting Program Specialist or Course Director in developing training curriculum, preparing training proposal, developing visual aids; Plan and workout all logistic to support training activities and coordinate the day-to-day operation to ensure smooth operation; Select the sites for field visits, plan and prepare program itinerary and background material of the projects; Prepare internal budget of training courses and monitor financial disbursements of training projects and prepare training program evaluation and completion reports. Ms. Kanlaya has organized several training courses related to education management, quality assurance in higher education, training of trainers/teachers, universal primary healthcare, urban development and management, innovative irrigation management, poverty mapping, national accounts statistics, agriculture commercialization and marketing, strategic human resource management and good governance in public sector for government officials from different ministries from Bangladesh, Bhutan, Ethiopia, India, Iraq, Lao PDR, Mongolia, Nepal, Pakistan, Philippine, Sri Lanka, and Thailand. On field management of each course, she prepares course content, course schedule, budgets, logistics arrangements, and day-to-day operation. Before she was a Program Assistant in the Agriculture & Water Resource Development Program of the Continuing Education from 1997-2001. Her main responsibilities are assist program officers in preparation and implementation of training course; prepare trip itinerary, follow-up contact of project hosts, book hotels and transportation, etc., follow up correspondences and reconfirm with resource persons, project hosts, hotels, transportation companies, etc. ; organize the reproduction and distribution of training materials; other works as assigned by supervisor. Ms. Kanlaya received her Bachelor Degree in Education Administration from Rajabhat Phanakhon Institute, Bangkok and Master Degree in Educational Technology from Kasetsart University, Bangkok, Thailand in 2001.